And what a month April has been! We have had everything from warm spring days, with blue cloudless skies, to icy sleet and driving rain. The last few days have seen miserable, unseasonably low temperatures, which felt more like winter than winter itself. All this cold grey weather has affected growth and checked it very noticeably. However, plants are still filling out, albeit more slowly, and there is less bare earth to be seen every day. There are lots of reasons to be cheerful at the moment, and the notable joy bringers are the tulips (except for the rogue red one in a pot of pink! 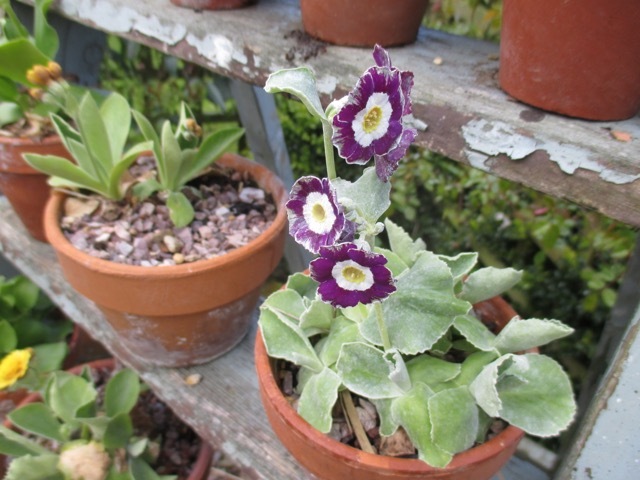 ), magnolia Stellata, Auriculas, primroses and Fritillaries. 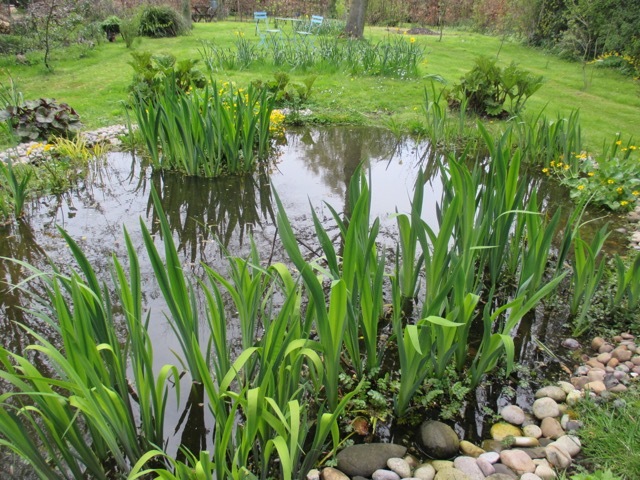 The pond has woken up and is full of small but determined tadpoles, striking out across open water, instead of hugging the banks. Although we have pond skaters, water beetles and snails, there is no sign whatsoever of any sticklebacks, which is very disappointing. They must have died off over the winter. 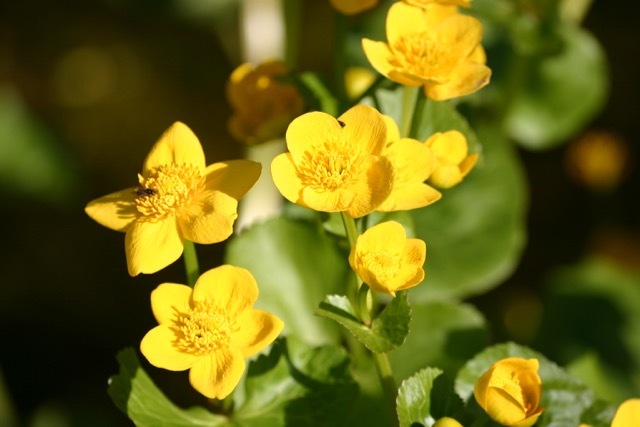 Pond plants are starting to grow and the yellow Marsh Marigolds are in full flower. 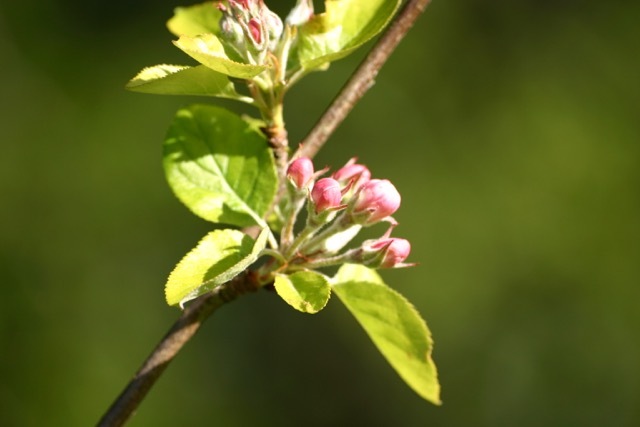 Buds are forming on the apple trees and it is to be hoped that the weather has warmed up by the time the blossom opens, otherwise it will be frosted. The beech hedge is just beginning to unfurl, with certain plants ahead of the others, and showing green. 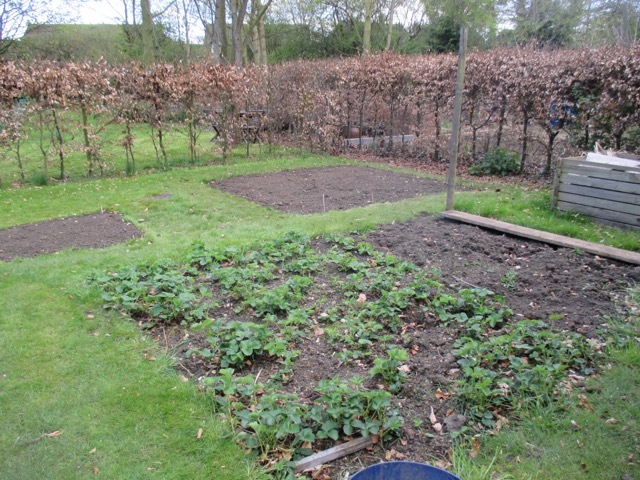 The veg patch is creaking slowly into life and Early Potatoes are now in, and onions are partially in. Courgettes, pumpkins and tomatoes are growing apace in the greenhouse, ready to be planted out when things warm up. 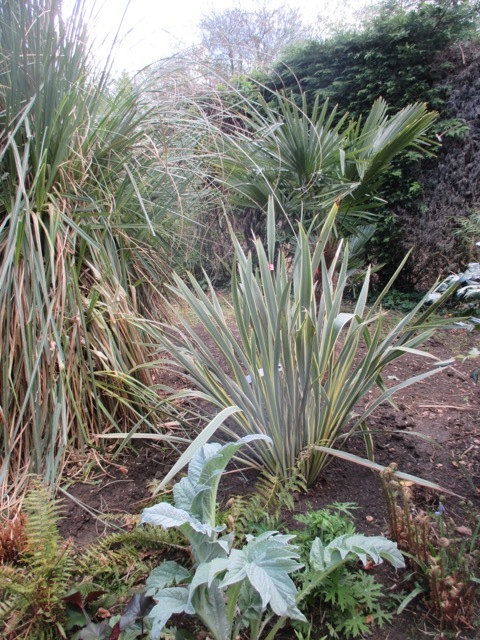 The new exotic garden now has all large key plants in position. The are lots of perennials already planted, which will come into their own over the next few months, and hundreds of waiting annuals to fill all the inevitable gaps. There is always a feeling of disappointment at this point in a new garden, as although most of the hard work has been done, it still looks unfinished and raw. It is, however, still just a skeleton, and will only take on its true character when the other elements are there too. It is now just a question of waiting for the plants to grow and put some flesh onto those bones! I have loved all the Erysimums and they have flowered throughout the winter. 'Bowles Mauve' is a trusty favourite, and the mauve flowers look fantastic offset by the glaucous foliage, but the real star is ... if I recall correctly ...'Winter Spice'. 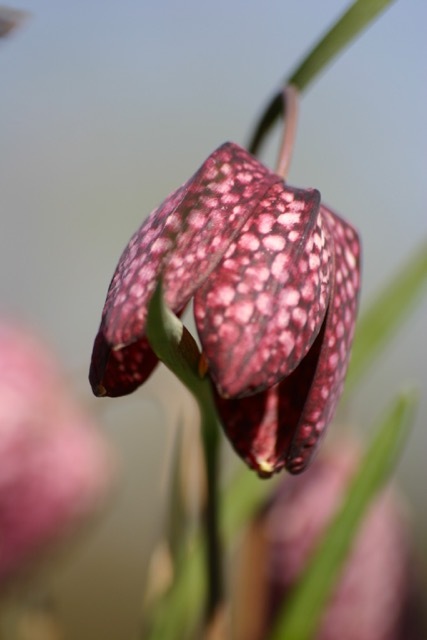 The flowers are a rich dark raspberry pink, and were a very welcome sight in late winter and early spring. Sadly the plants are very short-lived, and mine are going very leggy and starting to fall over after only a couple of years. Magnolia Stellata has been stunning but is now just past its best. The greenhouse is stuffed to the gunnels with plants ready to go outside when all frosts are over. Dahlias, cannas and melianthus are all growing strongly, enjoying the heat we have in there when it is really cold. 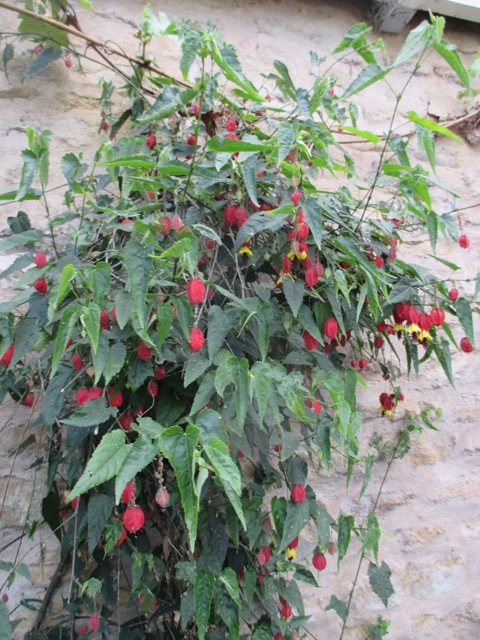 The Abutilon Megapotamicum is covered in flowers, as is the white Datura. 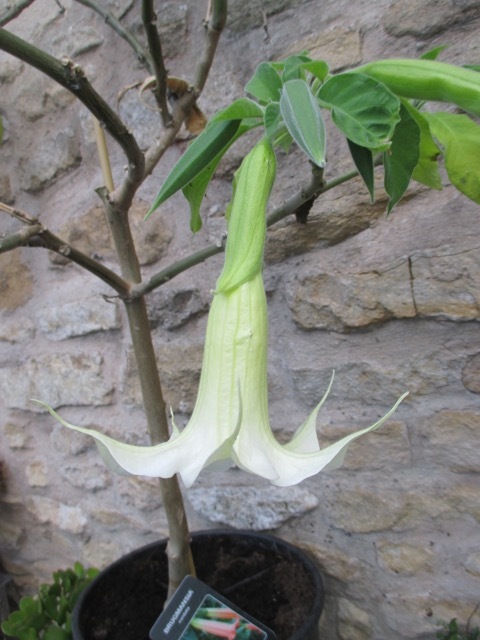 The lemony scent from the datura, released in the late afternoon/ early evening is superb. 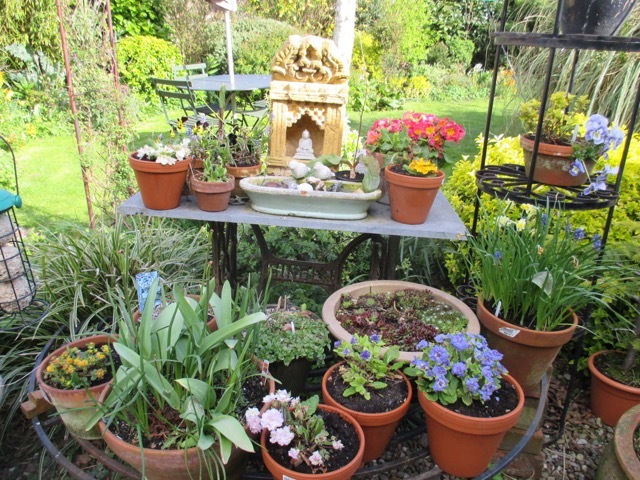 It has been such as odd start to the season, due to the extremes of weather the poor plants have had to cope with, but, due to the mildness of the winter itself, everything has made it through unscathed, ready to start growing again. Aw thank you! I love that part of the year when new growth just goes crazy! You do have some lovely things happening! 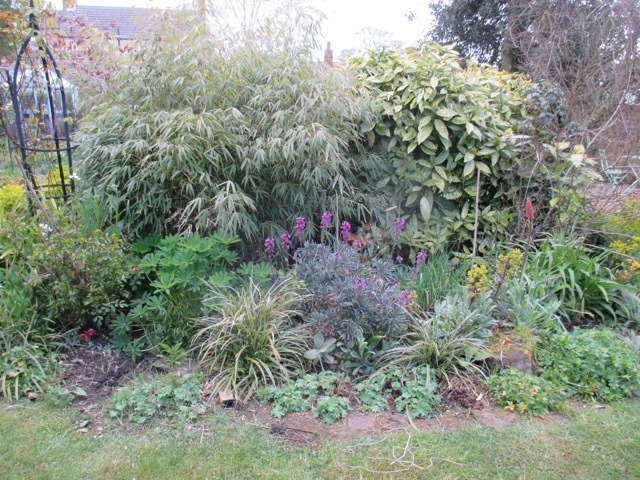 I like the way you have different sections of your garden for different types of plants. Mine is kind of all just mixed--except for the vegetable garden. Actually--I planted my cutting garden in the vegetable garden this year! So yes, it is all mixed! Your garden looks like it would be a perfect place to explore! 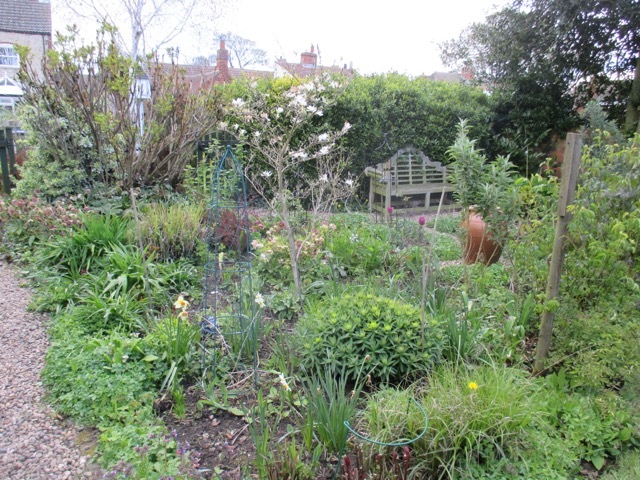 Thank you Linnae, the garden was easy to divide into sections as it is long and thin, so the divisions sort of suggested themselves. 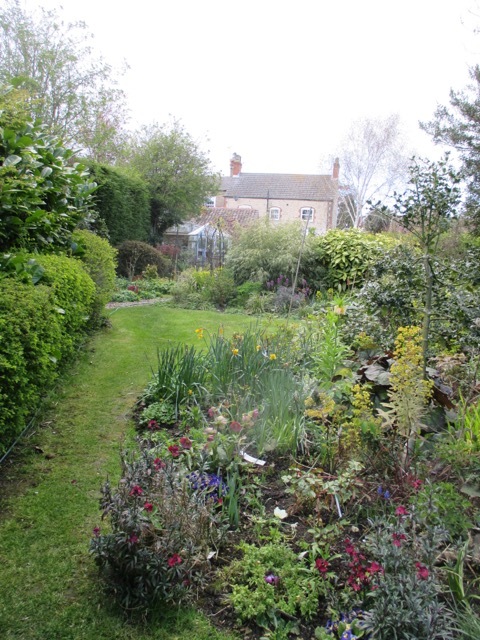 I like the idea of 'mixed' too, especially the cutting garden in the veg plot! It feels like the last month everything has been on hold here. The chilly weather has definitely had an impact. 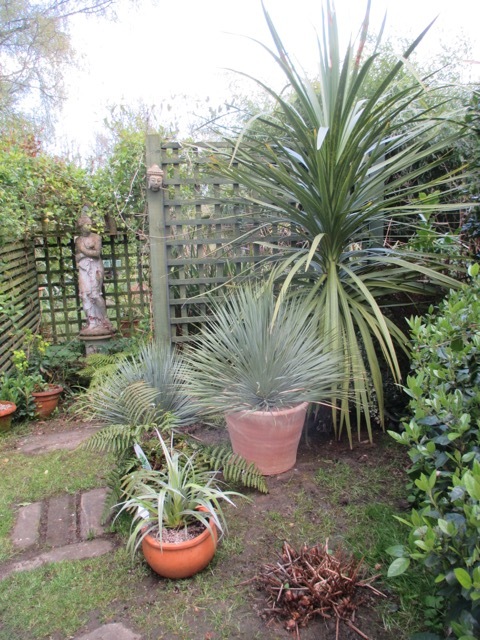 Your exotic garden is looking good already, starting with a few statement plants is a good plan. Look forward to seeing it develop. I know what you mean, Jessica. I guess the good thing is that the weeds have been on hold too! 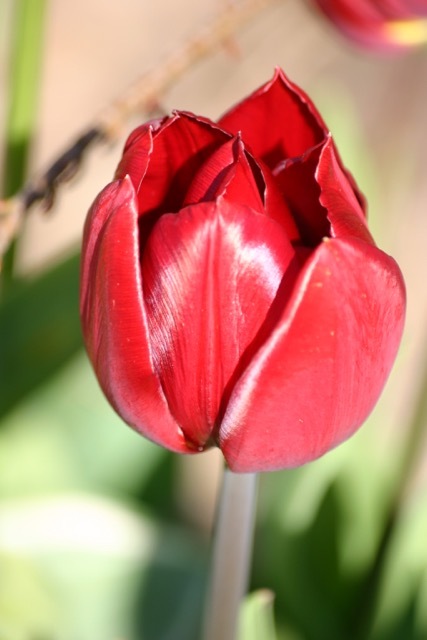 It is a really silky, tactile tulip Sue! Yes we do heat one greenhouse and leave one unheated. It is the first year we have done it 'properly' and it has really paid off as dahlias and cannas are very advanced and things like geraniums have sailed through the winter and are now flowering. It has been mild though. Do you heat yours ? No we don't - it isn't worth the expense for the plants we pop in there over winter, They have to rough it! The weather has been strange world wide.....let's hope you don't have to deal with anymore frost. In any case, your gardens really are coming to life! 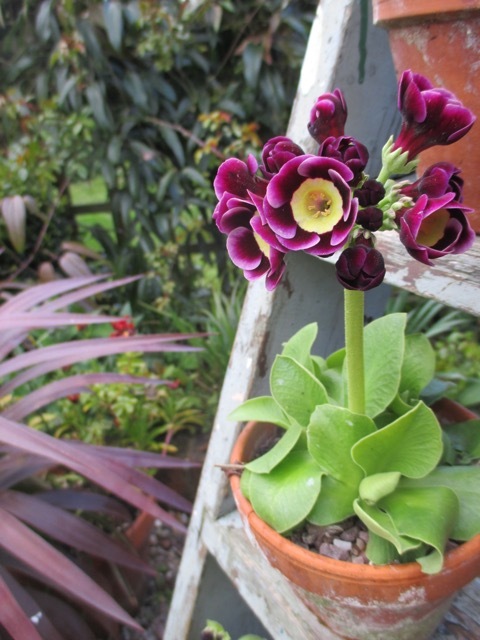 You have a knack with Primula...so beautiful! 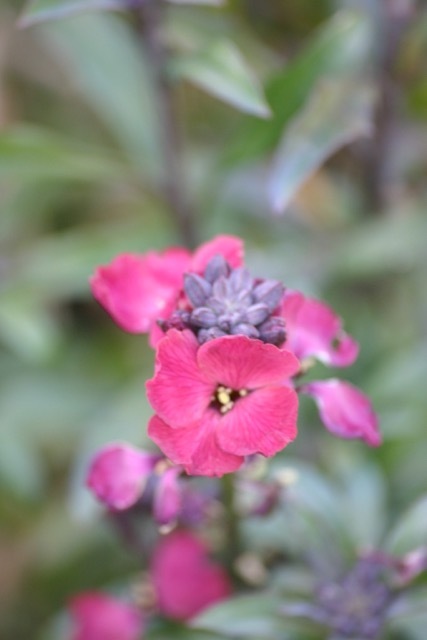 The Erysimums are said to be short lived, I understand they are easy to propagate from cuttings. The Datura is fantastic. Your garden is looking quite lush. I envy you the primroses. It gets too hot and dry here for them. Here being SW Indiana in the US. Your garden is looking so good and you seem to be on top of everything. It has been a strange month weatherwise hasn't it, hopefully the promised warmth will arrive this week. I have been away for a week and I was surprised to find the garden much as I left it. The only thing that has grown is the grass. But now it is warmer I expect there will be changes every day. 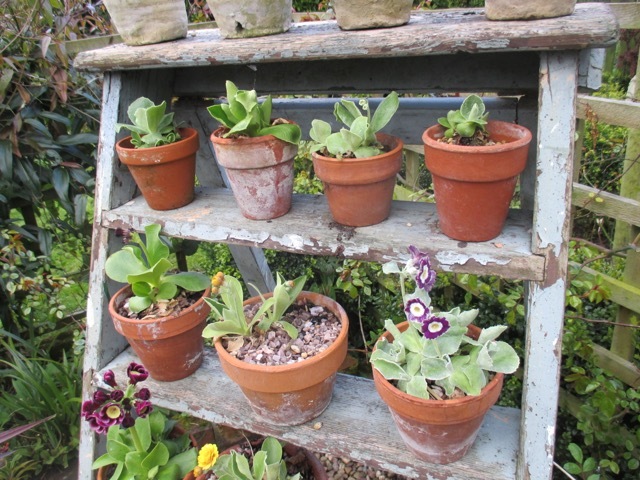 I am looking out for an old ladder for displaying auriculas; such a great idea. Yours look lovely. 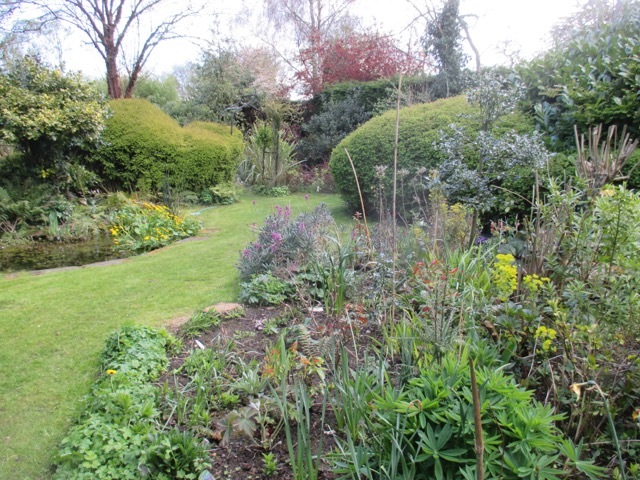 Your garden looks so well cared for and with so many beautiful plants coming on. I am looking forward to seeing your dahlias and cannas later in the year. We've had a couple of stretches of high temps that kicked everything into high gear. The phase you show here passed all too quickly, so it's a treat to revisit it via your blog.